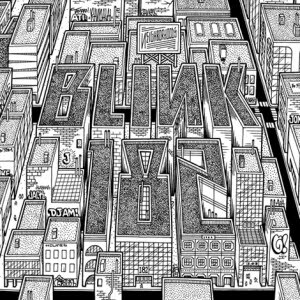 Eight years in the pipeline – with a split, a reformation, and a handful of life altering tragedies in the midst of that –‘Neighborhoods’ has been one of the most anticipated albums of 2011, and not to mention Blink-182’s career. Their 2003 self-titled LP saw the group starting to put their pants and jacket back on; dropping the songs about high-school heartbreak and bumming dogs in favor of more serious topics, yet still retaining that unique sense of angst and energy that has been so prevalent on each of their albums. Sonically speaking, ‘Blink-182’ served as an important milestone to get them to where they are now. ‘Neighborhoods’ is, to use a word that once stood bi-polar to the group, their most “mature” album to date, but after eight years worth of darkness, death, and doubt, it was almost impossible for them not to end up here – the dreamy, wistful landscape of ‘Blink-182’ now given way to a markedly blacker terrain that is as visceral as it is nightmarish. True to form, however, the bleak content of this album comes hand in hand with a sense of hope and optimism. ‘Neighborhoods’ bridges the gap between past and present, with nods to their earlier work from the perspective of their new, developed sound. With double- time tempos, driving melodies, and minimal production still intact, ‘Heart’s All Gone’ is a throwback to ‘Dude Ranch’, however its interlude is a pensive instrumental number which demonstrates their ability as musicians, not just songwriters. ‘Natives’, despite it being one of the darker tracks lyrically, embodies the same hard-hitting pop-punk force that characterized ‘Enema Of The State’. ‘Wishing Well’ also harks back to ‘Enema’ – it even has Tom DeLonge doing a “la-da-da-da” hook in the bridge: a feature which no Blink-182 album is complete without. So here we have a band comfortable with their origins, confident in their direction, and embracing themselves wholeheartedly to create a tangible sense of ease and assurance in their sound that could easily have been lost after so many side-projects and years apart. Greeted by trademark Travis Barker drumming, ‘Ghost On The Dance Floor’ bowls out as the opening track and knocks down any lingering illusions that Blink-182’s return ever could, or ever would be a tepid one. It sounds familiar in some ways, but the influence of outside projects is notable. The grandiose power-chord choruses of Angels and Airwaves and the star-smattered synths of +44 are present throughout the entire album, but rather than overwhelm, they help to enhance and support a sound that is essentially Blink’s. This is particularly true of ‘Up All Night’, which initially raised eyebrows and doubts when it was first released, seemingly splitting fans down the middle. However, the meaty riff and electronic flourishes that sounded jarring and uncharacteristic as the albums first taster feel like very natural progressions when heard in context; maintaining the pace following ‘Natives’ whilst also pushing ferocity and grit up a notch. As one of the more subdued, subtle moments, ‘After Midnight’ is easily one of the best tracks on the album. With delicate high-hat tapping, and Hoppus singing “We’ll stagger home after midnight, sleep arm in arm in the stairwell” over a gentle riff, it embodies that classic, warming Blink-182 sentimentality that has become such a poignant touchstone for their fans. Although there is a space and tension to the tracks created by writing and recording almost entirely in separate studios, there is also a real sense of release on ‘Neighborhoods’. It feels like a huge sigh of relief after eight years of drawing breath, and even though the dark matters haunting each track – depression, loss, and emotional conflict – function as a framework, they play through with a distinct feeling that the trio are giving up their ghosts. The final product is an album that is not so much experimental as it is progressive, and though there are moments where things may not flow so smoothly, as a whole ‘Neighborhoods’ is a completely at ease with itself, securing Blink-182’s status as a continually influential band who, rather than tripping over their past, have utilized it as a stepping stone to somewhere equally significant. 'Neighborhoods' is out now on DGC/Interscope Records.